At CMCI, we use cutting-edge technologies to solve our customers’ unique challenges in the “as-is” environment while designing and implementing the technology road map for the “to-be” environment. We are a Small Disadvantaged Business (SDB), but the quality of our holistic IT solutions far exceeds the size of our staff. We attract and retain subject matter experts who are outside-the-box thinkers and thrive on solving big technology and business challenges for missions that protect the safety and health of the American public. Our top-notch talent and corporate agility delivers the efficiency of a small company in parallel with the sophisticated solutioning and technology horsepower of a much larger organization. And our corporate commitment to quality ensures our solutions are reliable, repeatable and extensible to keep pace with your mission over time. To make our customers successful. VISION: We drive mission success for our government customers by leveraging innovation and cutting-edge technology solutions. By delivering agility, quality and cost-efficiency in every aspect of our services and delivery, we maximize the value our customers deliver to their constituents. CMCI was founded in 2005 by Pulak Chakrabarti, one of the industry’s leading visionaries and thought leaders, to empower customers to achieve their business goals in today's highly-competitive market. Mr. Chakrabarti’s vision was – and still is today – to deliver cost-effective, transparent, innovative technology and business solutions that demonstrate quality and value to CMCI’s customers. Our singular focus is ensuring the mission success of the customers and organizations we serve. To that end, over the past 13 years CMCI’s support and solutions have increasingly come to revolve around one unifying core competency: leading technology transformation to keep pace with our customers’ business and mission requirements. Mr. Chakrabarti has more than 25 years of experience leading mission-critical programs and technology initiatives for some of the largest and most complex federal enterprises. He is a recognized thought leader in risk and threat management, screening and targeting, and the extended global supply chain. Prior to founding CMCI, Mr. Chakrabarti led large federal enterprise programs and technology initiatives in the homeland security and law enforcement arenas for companies such as Lockheed Martin, FiServ Inc, HCL-Hewlett Packard, BTS, TIL Ltd and Indian Statistical Institute. He quickly gained recognition among federal executives as a trusted advisor who consistently delivered strategic initiatives and drove tangible improvements in organizational and operational effectiveness. 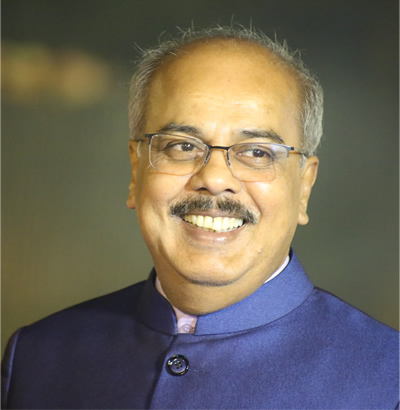 As a management consultant and strategic advisor at the helm of CMCI, Mr. Chakrabarti provides overall strategy and vision, business acumen and technical leadership for large-scale systems design and implementation. Of particular note, Mr. Chakrabarti conceived the overarching technology roadmap for automated risk management and targeting initiatives for the federal agency charged with protecting our nation’s borders. U.S. Customs and Border Protection. These initiatives encompass some of the most sophisticated mission-critical systems in the federal domain and now serve as the cornerstone of all law enforcement and homeland security activities in protecting our nation’s borders and securing the global supply chain. As the pace of technology changes propels federal agencies towards modernization, Mr. Chakrabarti’s vision and relentless commitment to excellence will continue to drive innovation for CMCI’s customers’ ever-evolving mission and business needs.